The Pistons have been hot since the All-Star break, going 11-4 straight up and 10-5 against the spread to catapult themselves into the thick of the Eastern Conference playoff race. They've also been playing well on the road, but now take a step up in competition against the favored Blazers. The Pistons have been hot since the All-Star break, going 11-4 straight up and 10-5 against the spread to catapult themselves into [the thick of the Eastern Conference playoff race](https://www.thescore.com/nba/standings). They've also been playing well on the road, but now take a step up in competition Saturday against the favored Blazers. Detroit is a 5-point underdog for the third leg of its season-long five-game road trip (9:05 p.m. CT, NBA TV) in Portland. 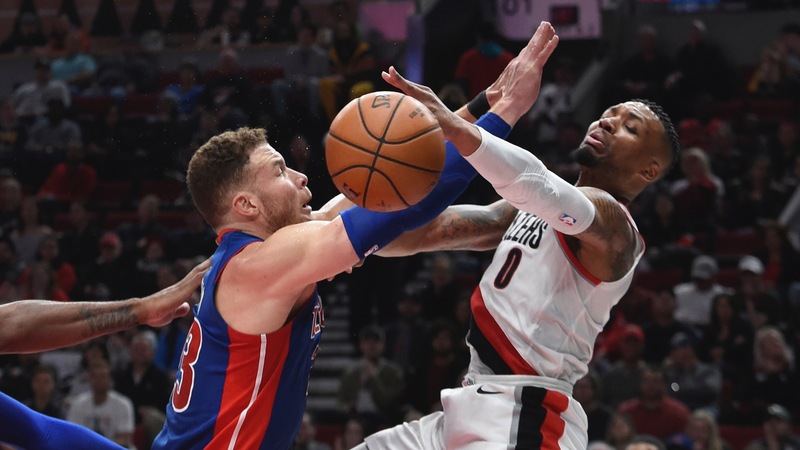 The total for the game is 216, with the Pistons +180 on the moneyline and Blazers -220. The Pistons (37-34, 36-34-1 ATS, 14-21 away, 17-18 ATS road), are 5-4 on the road SU (4-5 ATS) since the break, but four of the straight-up victories have come against some of the league's worst teams -- Atlanta, Cleveland, Chicago and Phoenix (the other was against Miami). Detroit also lost in Cleveland on Monday and had back-to-back road losses in Brooklyn and Miami last week by a combined 62 points. So it's been a mixed bag. Detroit is coming off [a 118-98 win](https://www.thescore.com/nba/events/135677) Thursday in Phoenix, as Wayne Ellington scored 23 points and hit six of the Pistons' 17 3-pointers, while Blake Griffin had 17 points, seven rebounds and eight assists. <a href="https://www.youtube.com/watch?v=LNzsAPT81a8" class="embedly-card" data-card-width="100%" data-card-controls="0">Embedded content: https://www.youtube.com/watch?v=LNzsAPT81a8</a> The Blazers (44-27, 40-31 ATS), due to a quirk in the schedule, will be playing only their fifth home game since the All-Star break. They are 3-1 SU but only 1-3 ATS in the last four at the Moda Center, where they are 27-9 SU and 22-14 ATS. They've also lost five of their last eight ATS after covering seven straight. Portland, which is in position for home-court advantage in the first round ahead of a logjam of teams, earned [a 126-118 win](https://www.thescore.com/nba/events/135673) Wednesday over the Mavs as a 10-point favorite. It's not quite at James Harden level, but Damian Lillard has three straight 30-point games, including 33 points and 12 assists against Dallas. C.J. McCollum has missed the last two games with a knee injury. He returned to practice Friday but is unlikely to play Saturday. This will be the first meeting of the season between these teams, and they will play again next Saturday in Detroit. The next nationally-televised NBA game not on NBATV will be Tuesday, with [the men's and women's NCAA Tournaments](https://www.betchicago.com/ncaa-basketball-betting) taking over TNT and ESPN through Monday. Let's get to the rest of the eight-game Saturday NBA card, which includes [the Bulls](https://www.betchicago.com/ncaa-tournament-2019-players-bulls-nba-draft) playing host to the likely playoff-bound Jazz. The Sixers visit the Hawks in the first game of NBATV's doubleheader. __MORE:__ [76ers come back to beat Celtics, but Philly bettors suffer bad beat](https://www.betchicago.com/nba-bad-beat-76ers-celtics) ## Saturday NBA betting lines, odds, trends *Odds from William Hill; all times Central; records from [TeamRankings.com](https://www.teamrankings.com/nba/trends/ats_trends/?sc=all_games)* ### Celtics at Hornets odds, 5 p.m. BOS: 43-29, 34-36-2 ATS, 17-18 road, 14-19-2 ATS road CHA: 32-39, 31-38-2 ATS, 22-15 home, 17-18-2 ATS home __Spread:__ Celtics -3 __Total:__ 222 __Moneyline:__ Celtics -155, Hornets +135 __Betting tip:__ Boston, which is 6-8 SU and 5-8-1 ATS since the All-Star break, will be without Al Hoford, who will sit with knee soreness, and Gordon Hayward, who remains out with a concussion. Charlotte, which is still mathematically alive for a playoff spot with 11 games remaining, is 5-9 SU and 4-9-1 ATS since the break. ### Heat at Wizards odds, 6 p.m. MIA: 35-37, 39-33 ATS, 18-17 road, 23-12 ATS road (best in league) WSH: 30-43, 35-38 ATS, 22-15 home, 24-13 ATS home __Spread:__ Wizards -1.5 __Total:__ 221.5 __Moneyline:__ Wizards -125, Heat +105 __Betting tip:__ Washington, which will be without forward Trevor Ariza (groin) has won eight of 11 ATS despite being 5-6 SU in that stretch. Miami's Justise Winslow is questionable after missing the last four games with a thigh injury. __ALSO SEE:__ [Players in NCAA Tournament we may see in a Bulls uniform next season](https://www.betchicago.com/ncaa-tournament-2019-players-bulls-nba-draft) ### 76ers at Hawks odds, 6:30 p.m., NBATV PHI: 47-25, 34-38 ATS, 18-16 road, 15-19 ATS road ATL: 25-48, 36-37 ATS, 14-22 home, 15-21 ATS home __Spread:__ 76ers -8 __Total:__ 236.5 __Moneyline:__ 76ers -400, Hawks +300 __Betting tip:__ Philly has won six in a row SU but is only 3-3 ATS in that stretch. Atlanta is 11-4 ATS since the All-Star break (6-9 SU). __Bookmark us:__ [Daily NBA betting coverage](https://www.betchicago.com/nba-betting) ### Jazz at Bulls odds, 7 p.m. UTA: 42-30, 38-32-2 ATS, 19-18 road, 20-16-1 ATS road CHI: 21-52, 33-38-2 ATS, 9-27 home, 14-22 ATS home __Spread:__ Jazz -10 __Total:__ 218.5 __Moneyline:__ Jazz -550, Bulls +400 __Betting tip:__ Chicago's Zach LaVine will be a game-time decision after missing Wednesday's win over the Wizards with a thigh injury. Utah has won five of six SU and ATS. ### Timberwolves at Grizzlies odds, 7 p.m. MIN: 32-40, 34-38 ATS, 9-29 road, 15-23 ATS road MEM: 29-43, 34-37-1 ATS, 19-17 home, 20-16 ATS home __Spread:__ Pick 'em __Total:__ 216 __Moneyline:__ Grizzlies -110, Timberwolves +110 __Betting tip:__ Minnesota has lost five in a row SU and ATS, including four straight UNDERs. Memphis has won six of eight ATS. ### Mavs at Warriors odds, 7:30 p.m. DAL: 28-44, 40-32 ATS, 6-30 road (worst in league), 18-18 ATS road GS: 49-22, 30-40-1 ATS, 25-10 home, 13-21-1 ATS home __Spread:__ Warriors -14 __Total:__ 222.5 __Moneyline:__ Warriors -1600, Mavs +900 __Betting tip:__ Steph Curry will get a rest day, while Dallas guard Tim Hardaway Jr. will miss the rest of the season with a stress injury in his left leg. Golden State has had 10 straight games go UNDER. ### Suns at Kings odds, 9 p.m. PHX: 17-56, 33-40 ATS, 7-30 road, 17-20 ATS road SAC: 35-36, 42-27-2 ATS (best in league), 22-15 home, 24-11-2 ATS home (best) __Spread:__ Kings -10 __Total:__ 231 __Moneyline:__ Kings -600, Suns +425 __Betting tip:__ Phoenix will be without Kelly Oubre, who had thumb surgery Friday. Sacramento has won four of five ATS despite going 2-3 SU in that stretch. __PLAY:__ Our free [Daily NBA Pick 5 game](https://betchicago.chalkline.com/games/nba-pick-5). Pick five select NBA games ATS to win a BetChicago prize pack.